Just found this clip on Dean Shareski's blog, Ideas and Thoughts and thought I would share it as a funny (but sad) example of the state of education. I feel that I should offer some additional commentary. My initial thought was to question "what do you expect?" - not as a comment on So. Carolina or on women, but on the true values of beauty contests. Do we really look to our next Miss USA to be able to solve world problems? The piece begins with the question: "A recent survey suggests that a fifth of Americans cannot locate the United States on a world map. Why do you think this is?" While I don't feel that it has to do with South Africa or Iraq (as suggested - I think - by Miss So. Carolina), I really have no idea. I would offer that the survey has not identified a lack in our education but rather offers a comment about our culture and even our values. While we live in a global world, we cannot appreciate our position in this interconnected and interdependent world. We are insular. Perhaps this is a problem with our education. Are we not making a good enough effort to teach diversity and inspire appreciation of other cultures (and nations)? In any case, the clip is funny and does speak to the importance of communication. and tagged as culture. Currently, there are 3 comments. Can You Locate the U.S. on a Map? I am a big fan of the Charlie Rose Show. Perhaps I have been naive in the past, but I have always felt that Mr. Rose had the ability to ask the important questions. But my bubble was broken after watching his interview with Joel Klein, the Chancellor of the New York City Department of Education. The piece was essentially a big slap on the Chancellor's back celebrating his "successes". Throughout the interview, I was waiting for Charlie to ask the big question: "How do you measure success?" At one point Klein touts the 10% increase in students graduating and the increase in math and language scores. These are laudable stats, but I wanted Charlie to press him on these metrics as a measure of success. If I am to understand the Chancellor, he is interested in those teachers that can successfully teach to the test (improve test scores) and ensure that their kids pass so they can graduate. Never does he list as his targeted outcome the ability of these kids to think for themselves, formulate innovative solutions to problems, communicate ideas with others, work in an collaborative environment, or have a life-long interest in learning. I realize that I am an idealist but shouldn't NYC teachers be given credit if they form these skills and values in their kids? Now while I did find myself yelling at the TV (to no avail, I might add), I did enjoy listening to much of Mr. Klein's message. He stresses the teacher as the critical component in a child's education. To this end, I congratulate him. I am in favor of his outcome based pay and the notion that salaries should be based on ability. But the problem returns to how do you measure these outcomes and a teacher's ability? Graduation rates and test scores are easy outcomes to tabulate and on which to perform analysis. The more complex metric would involve measuring a host of less quantifiable outcomes. Isn't this the problem that we as teachers face everyday? Aren't we constantly challenged to find assessment models that value not just memorization, but truly understanding concepts? Another point Mr. Klein made that is worth noting was his characteristics that make a good teacher. He listed a teacher's ability to engage, capacity to empathize, and knowledge in his/her subject as the three essential components to successful teacher. I really like this list and would suggest that a teacher's interest in professional improvement is an even better indicator that pure knowledge of subject. A thirst for learning and excitement of subject translates better into success in the classroom than does expert knowledge and boredom with the mundane aspects of a subject. I would really like to hear your reactions to the Joel Klein interview. What are your thoughts on "merit" pay or salary commensurate on a teacher's ability? How do you measure success? and tagged as assessment, culture. Currently, there are no comments. As a blog reader, you don't need to be told that some of the best information comes from the discussions (comments) that follow a blog post. I read with interest Anne Davis' post on her new blogging project. But it was a particular comment (by Dean Shareski) that really caught my eye. It describe how a science class adapted a Darren Kuropatwa type class blog (link to blog). The comment also provided a link to a video where students discuss how this alternative form of assessment has impressed them. 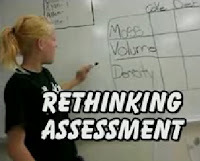 The video frames the conversation about "Assessment for Learning" with comments by students on how they were affected by this form of assessment. Coincidently (or not), the video's focus on students and their opinions mirrors objectives embraced by "Assessment for Learning" models. Students reflect on their next steps to be successful and gather evidence to show their learning. The role of the teacher is to provide clear expected outcomes and offer ideas on how students can demonstrate their success. High stakes summative assessment (assessment of learning) is getting a great deal of attention in schools (and the press). We are consumed with the need to enable our students to be successful on these (standardized) exams. As an AP teacher, I spent all of April reviewing past tests, drilling my students on a daily basis. This practice had positive results and I would not argue that we don't owe our students the tools to do well on these tests. My argument is that we need to form a balance between assessment of learning and assessment for learning giving more emphasis (time) to the latter. A friend of mine's sister is charged with "coaching" students who fall below a certain grade. Certainly, this program is a positive step toward the true nature of "no child left behind". But the school tabulates summative assessment scores on a weekly basis begging the question "with all of this assessment of learning, where is the time for assessment for learning?" As we progress as educators, rethinking assessment will be of paramount importance with traditional models being replaced by models that put the student in charge of demonstrating or providing evidence of his/her learning. Certainly, ePortfolios will play a important role in assessment. As a side note, does anyone know the difference between Assessment for Learning and formative learning? and tagged as assessment, collaboration. Currently, there are 4 comments.